Last week, I wrote here about David Boudia and Steele Johnson winning silver at the Olympics. Shortly afterwards, a woman I’d never met left a kind and gracious comment on my Facebook page. She is Cathy Jager, mother to Evan Jager. 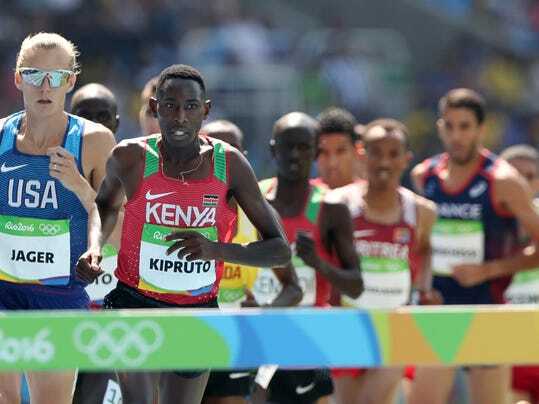 It turns out that Evan Jager competes in the steeplechase. He is a steeplechaser (can it be a predicate noun?). An Olympic steeplechaser, to be precise. In other words, he runs and jumps on land and through water really, really fast without falling or tripping over himself, which is what happens to me if I try to run even just through the backyard or jump even just from my relaxed reading position to an upright alert posture. I am not much of a mover or shaker or runner or jumper, let alone a steeplechaser. Steeplechasing (can it be a gerund subject?) doesn’t get a lot of air time. Nor does it get a lot of press time. We Americans are all Olympic-gaga about gymnastics and beach volleyball and swimming and diving. The related stories, interviews, and video clips are everywhere. But this morning, when Evan Jager was running in the final 3,000-meter steeplechase, I was driving through the state of Indiana, and I could not find a single radio station that talked about the running and the jumping on the land and through the water. Not one. Politics, country music, and other white noise. But no steeplechasing. And this afternoon, when I finally re-entered the world of wifi, I had to search and dig for a story about the race because, apparently, steeplechasing news isn’t headline news (which might be part of what’s wrong with the world today). But at last, I found this story (and there have been many more since then, which is gratifying and encouraging and, well, just right) which reported on how Evan Jager had steeplechased (can it be a past perfect verb?) and announced his silver medal. Because when asked about his performance, he said, “I think I had the perfect race today. I was just enjoying every second of it.” Notice that he didn’t say he was perfect, and notice that he didn’t diminish his excellent and stunning race even though he did not cross the line first. He raced well. He raced great. He raced awesomely. And he enjoyed doing it. He worked hard – very, very hard – and found it enjoyable, i.e. joyful. Hello, world. Pay attention. Because when asked by an interviewer if his silver medal felt like a gold medal (since the US Olympic steeplechase history [can it be a descriptive modifier?] isn’t exactly storied), Jager said, “No. It feels like silver, but I’m totally OK with silver.” Our world is big on telling everyone they are gold-medal-winner-worthy, and that anything less is unacceptable and not worth celebrating. But that’s ridiculous. Only one person crosses the line first. And that’s OK.
We are not all gold-medal-winner-worthy. Most of us are immeasurably far from being legitimate contenders or players or performers or participants in much of what life has to offer. There are countless things I cannot do at all, let alone do them well, and no amount of “I’m-amazing-I’m-awesome-I’m-fantastic-I’m-worthy” mirror-self-talk-fiddle-faddle will change that. I still cannot sing, dance, build a house, paint a picture, weld a joint, plumb a drain, construct a quilt, train a horse, do a lay-up, teach shop class, drop a water ski, do impeccable accounting, and a thousand other things. And that’s OK. My value as a person, your value as a person, our value as people is not found in whether we win gold or not. Evan Jager ran the steeplechase today. He was fast. He was fantastic. He was fabulous. He had a blast doing it. He enjoyed himself. He won a silver medal. And that is so very, very OK. That is amazing. And all of us non-running non-jumping non-fast non-steeplechasing people (can it be a negative gerund adjective?) should cheer him on because working hard with joy is something to celebrate over and over and over again. The Olympics – when we all become insanely interested in sports we know nothing about (and until this week possibly cared nothing about), scream wildly at our screens for people we’ve only just heard about (though we now consider them to be close friends), and cry uncontrollably for human interest stories awash in emotions on steroids (metaphorically, of course). Tonight, David Boudia and Steele Johnson won a silver medal for the US of A when they leapt backwards off a 10-meter platform, did a couple-and-a-half somersaulty things while also doing a couple-and-a-half twisty things at the same time, and then hit the water at the same time, at the same angle, making the same amount of non-splash. I have a difficult time walking the length of my house without tripping over something or other, so everything Olympian is a mystery to me. But it seemed to be just another day at the office for Boudia and Johnson. I don’t know David or Steele personally, but I would like to say “thank you” to them. Not because they represent my state (Indiana) and school (Purdue) with class. Not because they proudly wear the red, white, and blue. Not because they are bringing home silver for my country. because – and please don’t miss this because it matters immensely – when asked about their apparent sense of competitive yet calm confidence, they said this: they said that their identity does not lie in being a diver, or an Olympian, or a champion, but rather their identity lies in Christ – and that will never change, regardless of how they perform or score. the identity of those who follow Jesus is grounded in the fact that they are in Christ and Christ is in them. Nothing else in life falls into its correct place aside from this foundational truth. Whether we are a teacher, welder, merchant, musician, pastor, coach, banker, doctor, mentor, nurse, therapist, driver, doctor, artist, or diver, our identity is in Christ. I rather doubt the statements from David Boudia and Steele Johnson will be repeated and replayed in the Olympic news coverage. They weren’t flashy or controversial enough. No bother. We can – and must – repeat and replay them for ourselves. Daily. Hourly. Always. We are His. We are His. What else matters but that? All content copyright Crystal Kirgiss unless otherwise noted.